Having started his career in racing in the early 90s, Adam Carroll has gained numerous different experiences in a handful of motorsports series. With more than a decade of experience under his belt, the Irish driver was the perfect pick for the Panasonic Jaguar Racing team when they announced their comeback to single-seaters in form of a Formula E entry in season three. Carroll partners with the young and talented Mitch Evans, making the Jaguar line-up the perfect mixture of experience and young ferocity. The Irish driver is slowly starting to find his rhythm in the challenging series after he experienced a difficult start to his Formula E adventure due to several issues. Carroll has gained his first proper single-seater experiences in different British Formula series. In 2002, he secured the title in the British Formula 3 and and spent to more years in the series before he was able to move on to GP2. In the same year, he got the chance to test drive in Formula 1 for the first time, with another test outing in the following year. From 2007 onwards, Carroll started to gain more versatile experiences in racing. While he was still competing in GP”, he also drove in DTM with Audi, took part in the A1GP championship, IndyCar and Formula Renault 3.5. In 2012, he starting getting into GT-racing as he was driving in the FIA-GT1 world championship and also the Blancpain Endurance Series. Outings in the European Le Mans Series and British GT as well as WEC and the Pro-Am class of the International GT Open championship followed in the years to come. Even though he was always able to set highlights, he was barely able to fight for the top-positions in the respective series he was competing in at the time. 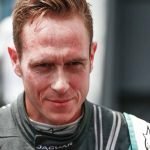 Therefore, in the end of 2016, he returned to single-seaters with Jaguar in Formula E.